The five-member gang travelled on the rooftop of the train and cut a hole in the roof of the cash compartment between Chinnasalem and Vriddhachalam railway stations. The five-member gang travelled on the rooftop of the train and cut a hole in the roof of the cash compartment . CHENNAI: Two years after a gang drilled a hole in the roof of a moving train containing cash and escaped with Rs 5.78 crore, CB-CID has arrested two men in connection with the crime. A hunt is on for others. Investigation revealed that the men took away cash from the compartment and wrapped them in their lungis. 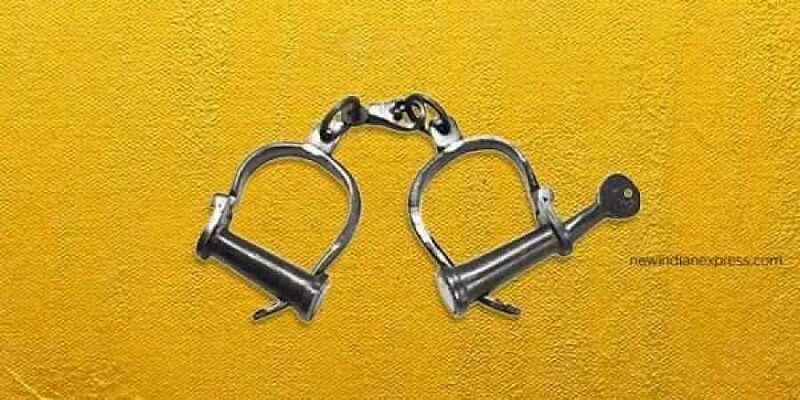 The two were identified as B Dinesh (38) and R Rohan Pardi (29) from Ratlam in Madhya Pradesh. The gang leader Moharsingh is currently lodged in Guna Central prison in Madhya Pradesh in connection with other crimes. According to a CB-CID press release, two men entered the compartment through the hole, broke open the wooden boxes and took the cash. They wrapped the money in lungis and passed it on to three other men on the rooftop. The release said that while the train was reaching Vriddhachalam railway station, those on the rooftop handed over the cash bundles wrapped in lungis to other gang members who were waiting at the trackside and all of them fled the spot. On August 8, 2016, a cash load of currency was transported from Indian Overseas Bank in Salem to Reserve Bank of India in Chennai. A railway parcel van VPH 08831 was attached to Salem - Chennai Egmore Express train. The train left Salem junction at 9.05 pm and arrived at Egmore at 3.55 am on August 9. The parcel van was opened around 11 am by RBI officials and they found that Rs 5.78 crore had been stolen from the van after making a hole in the roof. Government railway police, Egmore, registered a case on August 9, 2016 and the case was transferred to Crime Branch CID two days later. CB CID officials said a special team was formed and it traveled throughout the country and collected information from informants who were set up at various places. According to the tip-off, DSP Krishnan of CB CID and his team visited Ujjain and Guna districts in Madhya Pradesh. They collected technical inputs, detailed analysis of various scattered pieces of information were put together and the suspects were tracked. Dinesh and Rohan Pardi were arrested on their journey to Chennai on Friday. The criminals from Pardi group were involved in various cases across Madhya Pradesh, Rajasthan, Delhi, Haryana, Gujarat and Maharashtra. The network of members stay on the roadsides or near railway tracks raising temporary shelters. They work as daily wage workers and street vendors and they spot the scene to commit crime, the release said.